Keeping them is much tension, getting rid of them is irksome. Confidential documents sure are a big headache for institutions. Most either shred them or consign them to flames, when they have no use for such paper. 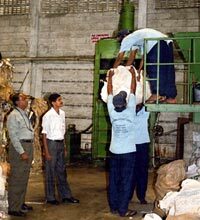 But in Sri Lanka, companies have found an environment-friendly way of disposing confidential waste: since the last seven years, 250 banks and other companies including many audit and legal firms send their 'confidential' waste paper to Neptune Papers (pvt) Ltd, in Wellampitiya, Colombo. This company recycles them. "We started this programme seven years back, because the company has a vision of recycling paper instead of burning it. Burning ruins the environment and by recycling a tonne of paper we can save 17 trees and 31,780 litres of water," says Tuan Faizal Bucker, a spokesman for the company. "It is a not-for-profit service that we offer," he adds. Many Sri Lankan companies have benefited from this useful exercise. Thurairajah and Company, a legal firm, had stacks of documents piling up at its storehouse in Colombo and didn't know what to do. "We wrote to clients asking them to take them away but got few replies. Finally we called in Neptune to take it away," says Asha Hannan, a company official. Many banks send their officers to the company site to make sure the paper is shredded but over the years, that number is decreasing as trust has overcome suspicion. Neptune collects around 2,500 tonnes of various types of waste paper per month. At the company's processing unit, metals, plastics and other waste materials are separated. The paper is then crushed into tiny pieces by a machine. This is then fed to another machine for mixing and compressing into bales. Last year Neptune exported 50,000 tonnes of waste paper, earning us $5 million. It hopes to export about 55, 000 tonnes this year, says Bucker, with justified optimism.